Our new 2018 crop is almost ready for harvesting. Some of you may have read The Indigo Girl, by Natasha Boyd. In the story, it talks about carefully checking the plant every morning to see if it is ready. No one says exactly what to look for but I know that when the flower is just about ready to bloom, the indigo is ready to be harvested. Why? Because the energy accumulated in the leaf for pigment production goes to the flower to bloom so it is important to not miss that window. When it is time, the plant is harvested half way in September so it can grow again till the next harvest in October. 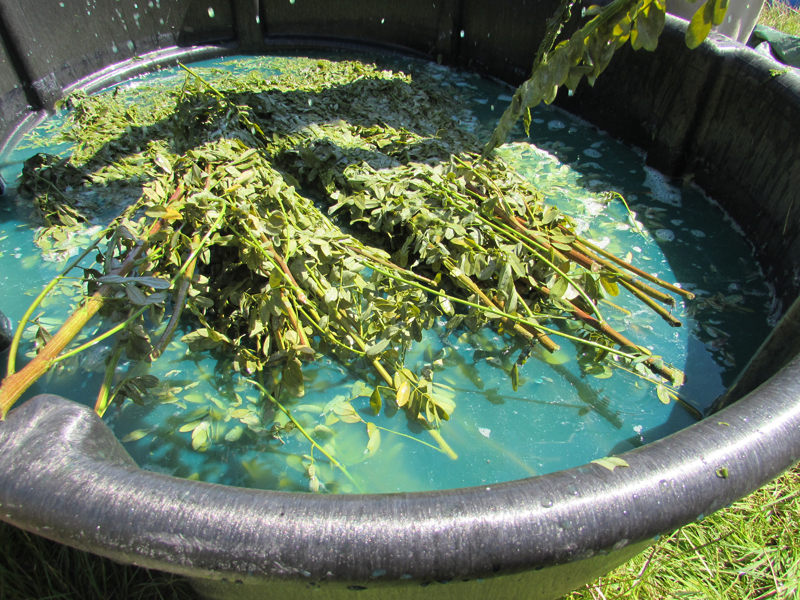 The stems are bundled, washed and submerged in warm water for 24 hours. That is when the magic happens, or a natural chemical reaction. After beating the liquid and adding a little lime, the pigment starts to separate and floats. It is now time to siphon the liquid and this year we are using special home-made cone bags made of nylon screen so the liquid drains easily and we are left with the solid: the fresh pigment, Blue Gold Indigo. Chi design indigo will be harvesting soon for our first batch of pigment but we are also offering a Farm-to-Fabric workshop where you will be able to see the plant, harvest it, pick the leaves, make the “blue of the heavens” and dye kitchen towels to take home. It is almost a full day. Lunch will be served and you will go home with lots of stories (past & present) and the botanical print of our local indigo printed on smooth fine art archival paper. This year, we are offering a workshop on Johns Island, Sunday September 23rd and in Bluffton on Wednesday October 10th. To register, simply go to www.chidesignindigo.com/workshops. One of my pleasures with indigo is teaching the process to groups of people. I host workshop at CHI design studio in Columbia SC often but sometimes I travel to beautiful places to give a class: Lake City & Moore Farm Botanical Gardens or Wild Dunes Resort for example. Everyone is eager to learn a new skill. They watch, listen, use their fingers, submerge their hands in the blue dye but the most fulfilling for me is when they open their art work and smile with WHOA's and WOW's..
To bring an indigo workshop to your location, please contact me via email chidesignindigo@gmail.com. A good group size is between 10 and 16. I bring all supplies and everyone leaves with their beautiful work and happiness on their face. My very first one-on-one student came from Charlotte NC. In her words, she is on a spiritual journey: "I too, am on an indigo journey, and have been looking for someone closer to the coast I can work with. I'd like to know what an individual day of instruction would look like. Would I be able to learn how to do an indigo vat, and experience working with natural powder? Would I be able to bring my notebook and ask questions about supplies, and techniques? I'm on a spiritual journey now, and indigo is part of that path." She completely got what she was looking for. We spent 6 hours together. She learned all shibori, mokume and katazome techniques. She learned how to make a natural non fermented indigo vat and how to dye properly with it. The rain caught us so she could not finish all her dyeing but she went home eager to get her own vat started in her small studio.